(LIHUE, KAUAI) – When Kawika Smith was a boy, his father would take him trekking through the mud and bogs of the Alakai Plateau. Now as the Kauai supervisor for the DLNR Division of Forestry and Wildlife’s Na Ala Hele Trail Access program, Smith is overseeing the replacement of nearly three-miles of 20-year-old boardwalk that carries hikers above the mud and water. Joined by every Na Ala Hele program staff member from around the state, this is a monumental undertaking. Actual construction began earlier this week with some 50 sling loads of material being flown into the area. The working conditions are challenging. You step in the wrong place and you could sink up to your chin in brackish, dark colored, stagnant water. It’s often wet, always muddy, and crews take care to avoid trampling the sensitive ecosystem. Since the weather at Alakai is constantly changing, it’s impossible to predict how long the replacement of the boardwalk will take. The Alakai is within the Alakai Wilderness Preserve and is one of Hawaii’s most unique, natural ecosystems. Its waters are created by Mt. Waialeale, one of the wettest spots on earth. At nearly a mile high in elevation, the Alakai is considered the world’s highest elevation rainforest and swamp. It is home to numerous rare and endangered plants, animals, and insects found nowhere else in the world. Protecting these rare creatures was a primary reason for the construction of the original wooden boardwalk, along with hiker safety. Without a clearly marked “trail” many people got lost and had to be rescued, because the terrain looks pretty much the same wherever you look. Anyone who’s made the hike in recent years has experienced the deterioration of the existing wooden and chicken wire boardwalk. In some places decay and rot have left large sections of the boardwalk missing or slowly sinking in the muck. In others, the chicken wire which is attached to the wood to provide traction is missing. 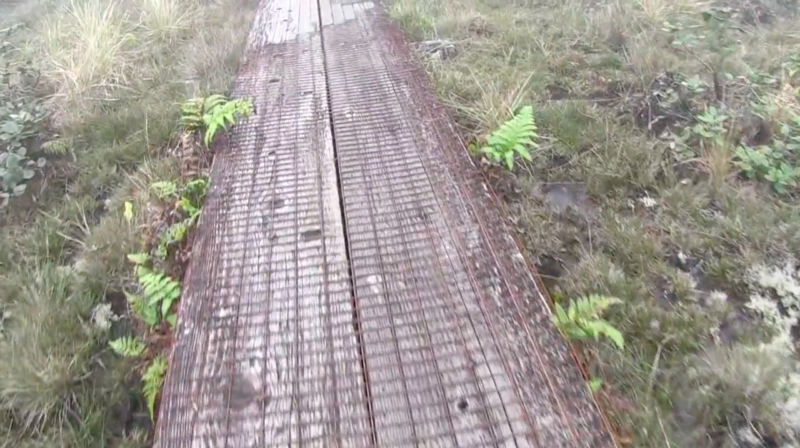 More than 20 years in the Alakai’s harsh environment has taken a real toll on the boardwalk, making it a challenge and a safety hazard for anyone who traverses it. “The Alakai boardwalk is one of the most unique features in our entire Na Ala Hele trail system,” said Suzanne Case, DLNR Chair. “Using capital improvement funding, allocated in 2014, we’re pleased to be able to spend the money to make this unique, world-class hike more enjoyable and safer for the thousands of people who travel through the swamp each year,” Case added.